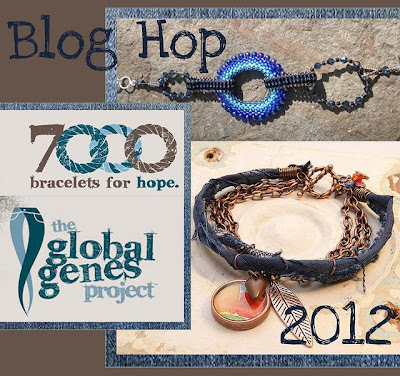 It's time for the reveal of our creations for the 7000 Bracelets for Hope Blog Hop. 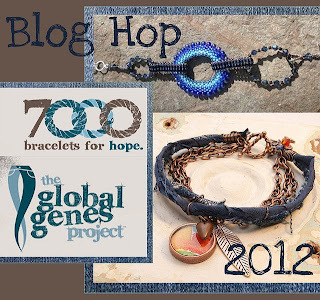 Erin of Elysian Studios and Christine of One Kiss Creations decided to co-host this year's blog hop to benefit the Global Gene's Project. It is their mission to collect 7000 denim-blue inspired bracelets for families living with rare disease. I participated in this same campaign last year when Lori of Pretty Things hosted the Hop. If you are interested in what I made last year, just click here to see my reveal. I started by picking my beads. Weirdly enough. 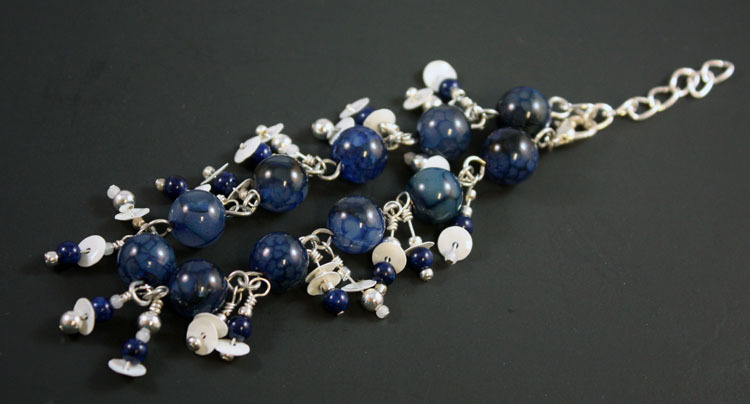 I decided to use the same beads as last year since they seem to be the perfect denim blue shade. In fact, I realized that I had already made a bracelet that would be perfect for the hop. However, but it was made with copper wire and I wanted something that was a bit more neutral. So, I started with a silver-tone wire for this bracelet. Using a heavy gauge wire, I connected the large, blue glass beads to each other with simple loops. While the beads simply lined up were pretty, the bracelet just didn't have any fun, movement, or joy that I wanted to add to the life of the family who receives the bracelet. So, I added some dangles that were created with white sequins as well as blue, white, and silver beads wire wrapped onto head pins. I wanted to make sure that the bracelet would fit a variety of wrists so an extender chain was added. I'll be sending it out the first of next week and sincerely hope that this little offering brings some hope and blessings to the family who receives it. I know it made me feel good to know it was going to a worthy cause. Anyway, that's enough of my rambling. Here's the list of the other Blog Hop participants, starting with our lovely hosts! Thank you so much for hopping by to see what I made. I can't wait to get hopping myself (I do love a good blog hop; a chance to discover like-minded artists) and see what everyone else created! Here's hoping your weekend is full of all kinds of happiness and FUN! I'm ba-ck! Back to see your bracelet reveal! Was a few minutes early while ago. I love the beads you are using. The styles of our bracelets are somewhat similar, yet each is unique. I like that! P.S. I checked out what you made last year. That was really nice too! Amazing how you can do so many things with the same beads, isn't it?! Love it - elegant, yet joyful and happy! What a great bracelet, I love dangles. Someone will be very pleased!!! Ahh your bracelet is so pretty and the silver goes so well with blue. I am sure this will bring a smile to the person receiving it. That's a beautiful bracelet! You did pick the perfect color beads! Hope, your bracelet is GREAT!!! I love, love, LOVE a bracelet with movement! Beautifully done!! Hope! This is fantastic! The dangles with the sequins are so happy and playful and I hope it brings that same joy to the wearer. We all need that reminder sometimes. 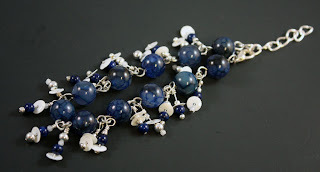 I love that you used the same blue beads as last year..a nice theme running through your Bracelet of Hope :-D Thanx so much for joining and for spreading the word! That's lovely Hope - looks like it will be so much fun to wear. Hope, your bracelet makes me so happy! I can almost feel the dangling beads on my wrist. Beautiful! I *LOVE* dangles and this is such a pretty bracelet. I know whomever gets this will cherish it. I just love the dangles! 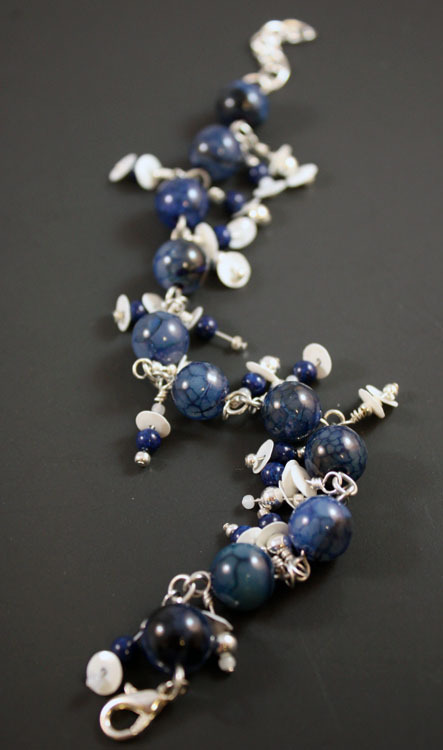 And the color of the blue beads with the silver is a great combo. Some mother will be very happy to receive such a beautiful piece. I love the flirty dangles on this bracelet. Very nice! Hope - this is so pretty. Love the dangles and how they will add movement. I think this will be a favorite of whoever gets it and rightly so!! Beautiful! 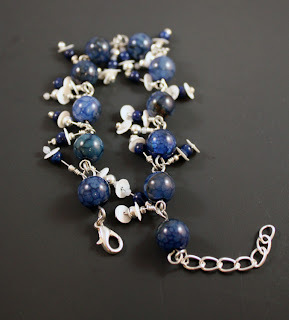 Love the little drops...and sodalite is one of my favs!!! (I used it too!!) Beautiful bracelet! I love your design! The dangles are perfect- I would have never thought to use sequins! The recipient of this bracelet is going to feel beautiful wearing it! Thanks for joining us for this hop! 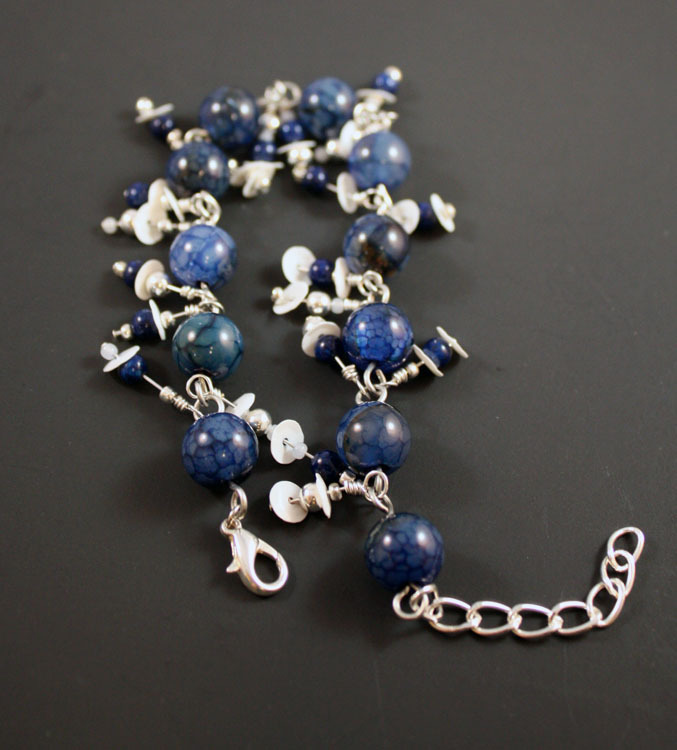 Your bracelet is beautiful and you are right, those beads are the perfect denim blue! I love the dangles in this piece. So clever to use sequins! Love your glass beads, they look so much like stone. With that shiny silver, they make a nice finished piece. Heya Hope, love this bracelet! It's swingy, fun and so full of life! Someone's going to be very happy with this! Love your choice of beads...the bracelet is beautiful! I agree...those dangles make it so much fun to wear! I can imagine how good this would look on the wrist and feel with all the movement. Beautiful work. I love your simple and stunning, sparkly creation!!! I see that you did the dangle dance jut like me. So much fun to do! I'm sure whoever receives it will love it. Fun - check. Movement - check. Joy! Check. You have certainly accomplished your goals with this lively and lovely bracelet! I love your bracelet! The dangles are so cute and fun and I love those blue glass beads. Hope, I love your thoughtfulness, and your desire to design something that will make the wearer smile. You are such a caring person, and I hope the recipient of your beautiful bracelet feels that each time she wears it. 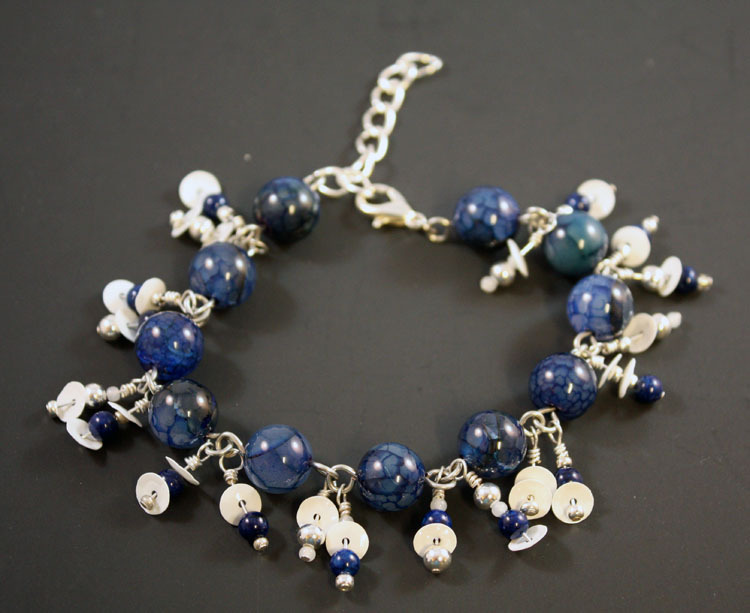 Love the blue beads that you used in the bracelet. great call on the extender. I like the fact it has the movement, sort of charm bracelet~y. As to using the same beads as last year's hop, I realized I used wood w/ blue last time too! Man I would luv to hear the melody this beauty sings when it moves! Gorgeous!!! Dangles definitely bring about joy ... it's just what they were made to do! =D Beautiful bracelet!!! This is so pretty! I am always in awe of folks who can make charms and attach them with wire. I can't make a wire loop for anything!! The colors are levely! I just want to say a super quick THANK YOU to all of you for your sweet comments. They are always appreciated!